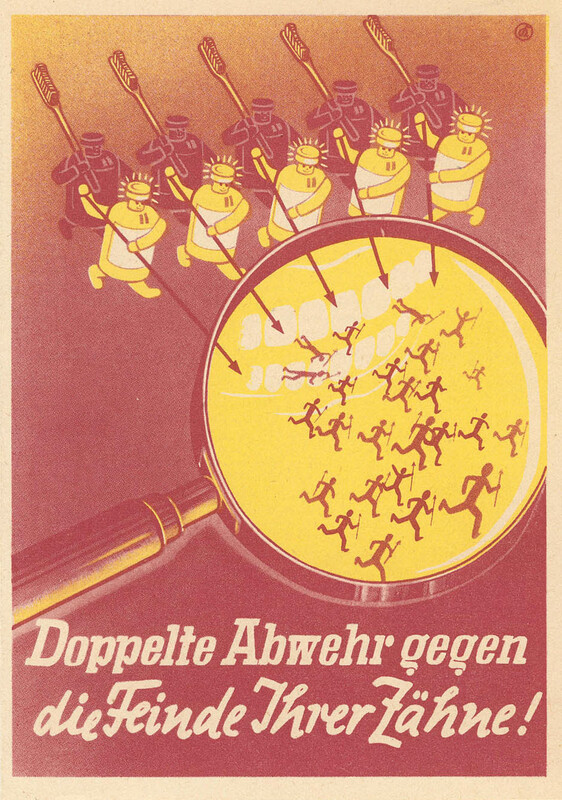 This story is adapted from the book Alsos, written by Samuel Goudsmit, H. Schuman Inc., New York, 1947. It appeared in the December 1996 issue of the Health Physics Society Newsletter. In the early 1940s, the U.S. was at war and extraordinary efforts were underway to build an atomic bomb. The government even went so far as to confiscate the uranium oxides used by ceramics manufacturers to produce red/orange glazes. More than a few collectors must have been upset at the disruption in their supply of red dinnerware. Still, sacrifices were required. Similar confiscations occurred in occupied Europe to supply the Nazi A-bomb project, and keeping track of Germany’s atomic research was an allied intelligence effort code-named Alsos (the Greek word for grove, as in General Leslie Groves). In the fall of 1944, the Alsos team learned that Auer Gesselshaft, a German chemical company involved in securing and processing uranium, had taken over the French company Terres-Rares during Nazi occupation. Ominously, Auer had shipped Terres-Rares’ massive supply of thorium to Germany. 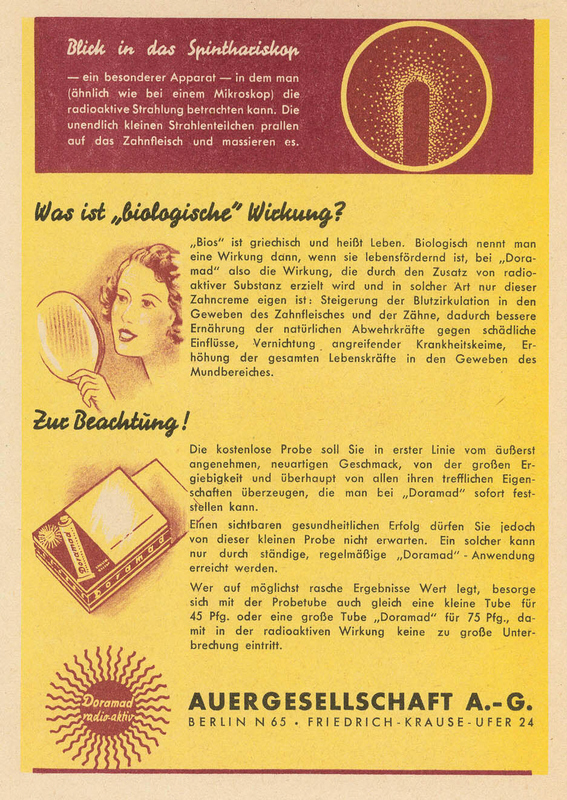 That the Germans wanted thorium suggested that their atomic research was further advanced than previously thought. Shortly after Paris was liberated, the Alsos team converged on the Terres-Rares office. They found it empty. Petersen, the Auer company chemist involved in securing the uranium and thorium supplies, had fled the allied advance (in Now It Can Be Told, Leslie Groves gives this man the name Jansen). Petersen had gone to a town on the French-German border searching for some missing railroad cars carrying the thorium. And, as luck would have it, the area was captured by the allies shortly after Petersen arrived. Alsos had their first prisoner—and a suitcase bulging with documents! Among these was a dossier on a businesswoman who plied the world’s oldest profession sur les rues de Paris. Petersen’s explanation for having the dossier was that the woman had charged him an exorbitant 3000 francs although “in Berlin . . . it is only seven marks and a half per fling.” He said he was hoping to contact the proper authorities (whoever they would be) to recover some of his money. When the Alsos investigators took to the streets, they found that all aspects of Petersen’s implausible story proved true. However, the suitcase’s most shocking document revealed that Petersen had recently visited Hechingen, a town rumored to be a center for atomic research. Later it would be learned that the Germans had a lab there with an isotope separation unit and, in a nearby cave, an experimental pile. When the site was eventually captured, a ton and a half of metallic uranium cubes from the pile (likely produced by the Auer company) were found buried in a nearby field. Petersen’s explanation for his trip to Hechingen: he was visiting his mother (no doubt seeking advice on how to recover his 3000 francs). Darn thing was, his mother actually lived there. With its radioactive radiation, it enhances the defensive abilities of teeth and gums. The cells are charged with new life energy, and the destructive power of bacteria is blocked. This results in excellent preventative and healing effects in the case of gum disease. Enamel is gently polished to brilliant whiteness. 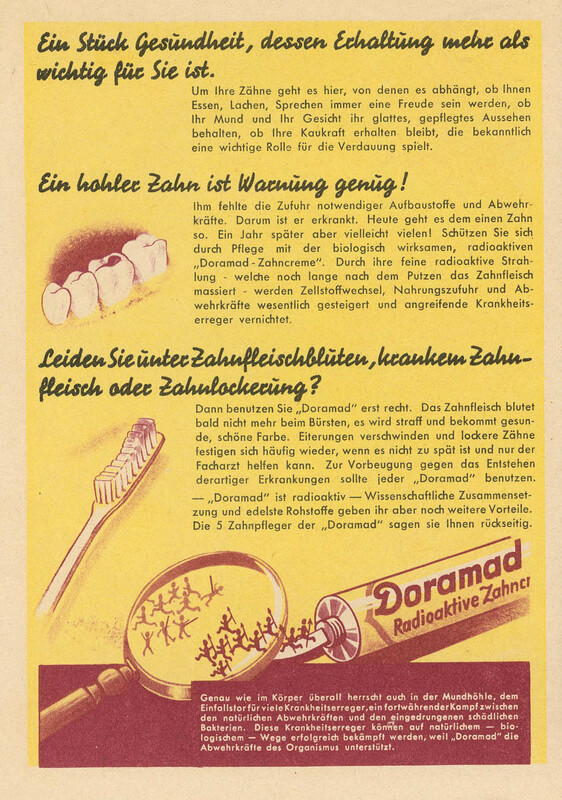 ts radioactive radiation increases the defenses of teeth and gums. The cells are loaded with new life energy, the bacteria are hindered in their destroying effect. This explains the excellent prophylaxis and healing process with gingival diseases. It gently polishes the dental enamel so it turns white and shiny. Prevents plaque buildup. Foams wonderfully with a new, pleasant, mild and refreshing taste. Can be used sparingly. 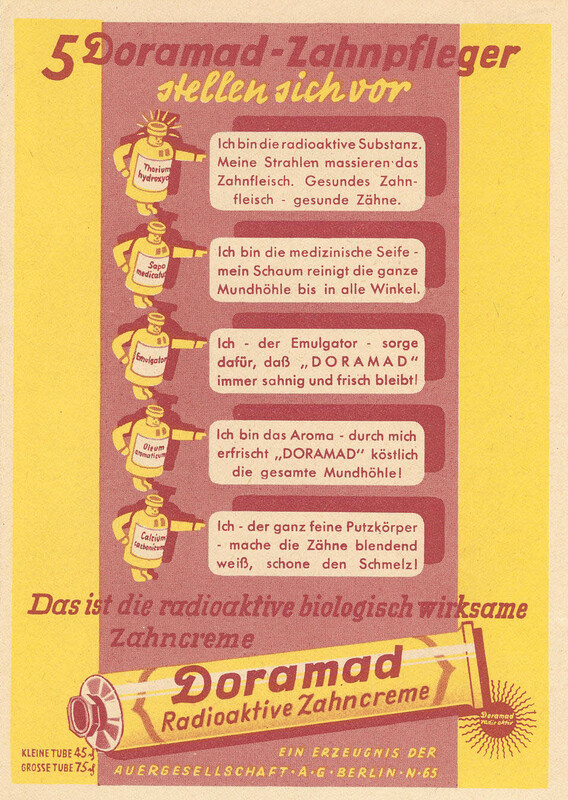 The following images are of a Doramad brochure. This is a good example of the kinds of radioactive quack cures which have been introduced over the years. If it had any effects at all, it would probably contribute to radium jaw. This entry was posted in Advertising, Corporate Folly, Selling it. Bookmark the permalink. Ach du lieber! Das is ganz schrecklich!